Ideal for window and door openings where youy don't wand overcutting at the corners. 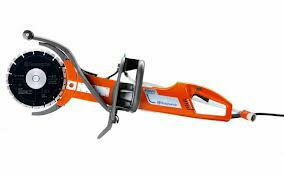 Deep cutting up to 16" X 3/4", exxcellent for cutting trenches for pipes and cables. Cut in stages through walls up to 16"
Each cut can be up to 2-1/2" deep and 3/4' wide. Since the cutter has twin blades, a core if formed in the saw cut. When the core has been broken off, continue cutting until the required depth is reached. * Please call us with any questions about our cut n break concrete saw electric rentals in the cities of Redwood City, Menlo Park, Palo Alto, San Mateo, San Francisco, Santa Clara and more.